I cannot tell you how exciting it was to see Margaret’s name pop into my inbox when she first inquired. 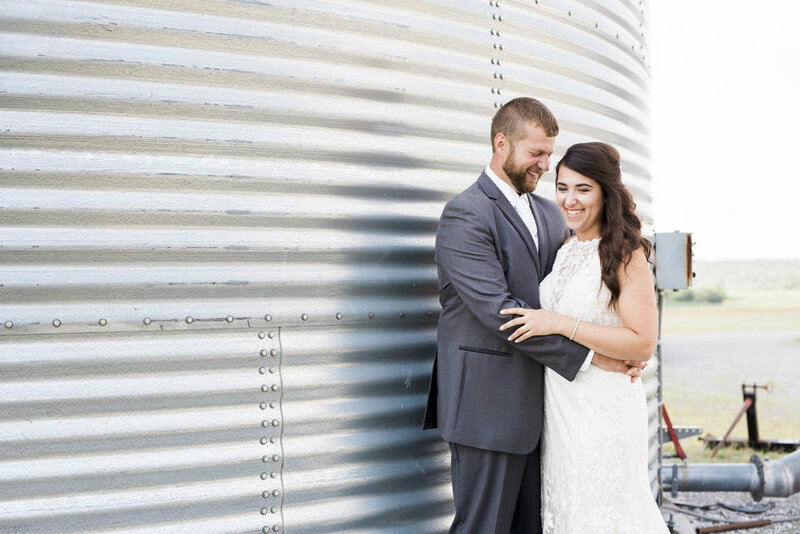 The two of us met at Southern Illinois University, Carbondale where we were both photography majors. 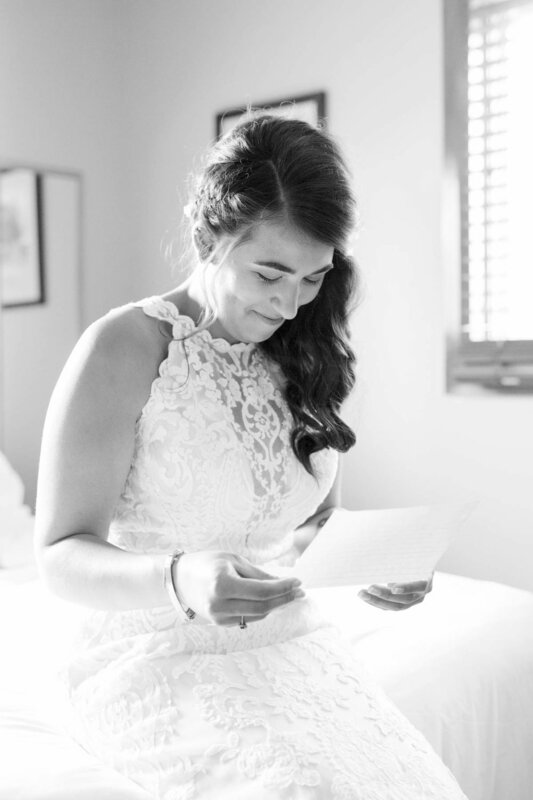 I was flattered that she trusted me with her wedding photography, and excited to get to know the guy she was so crazy about! Spending time with Margaret and Jonny is like hanging out with a couple of friends, because that’s what the two of them are…best friends. They enjoy anything and everything outdoors together, and spend most of their time joking and laughing. Their wedding day was a perfect reflection of that. 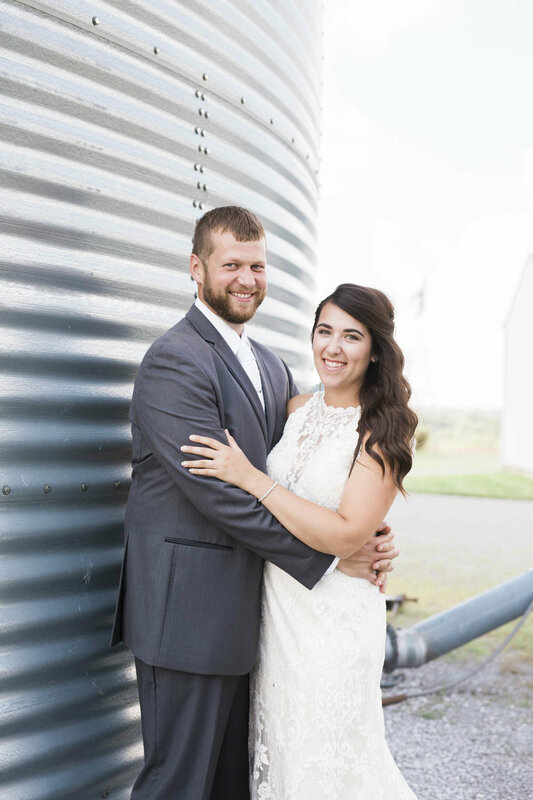 The wedding was held outside on the family farm, a place that means the world to Margaret, and now Jonny. 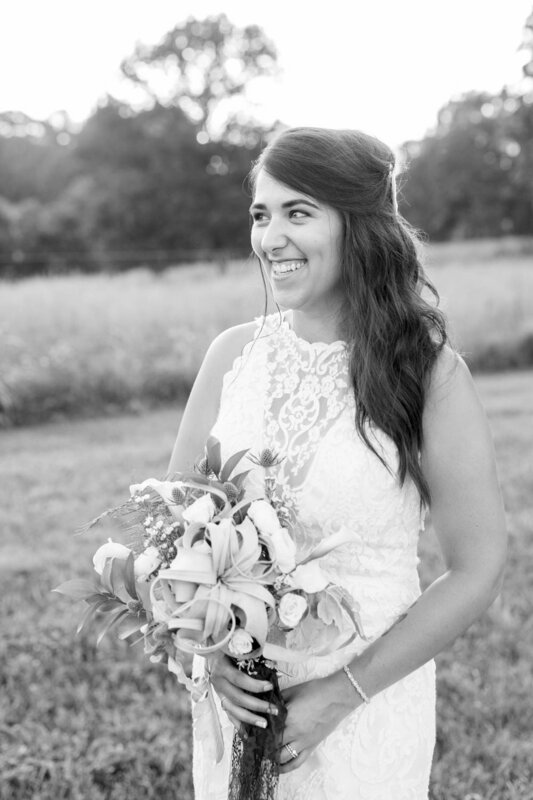 I’m a sucker for those outdoor, farm weddings! 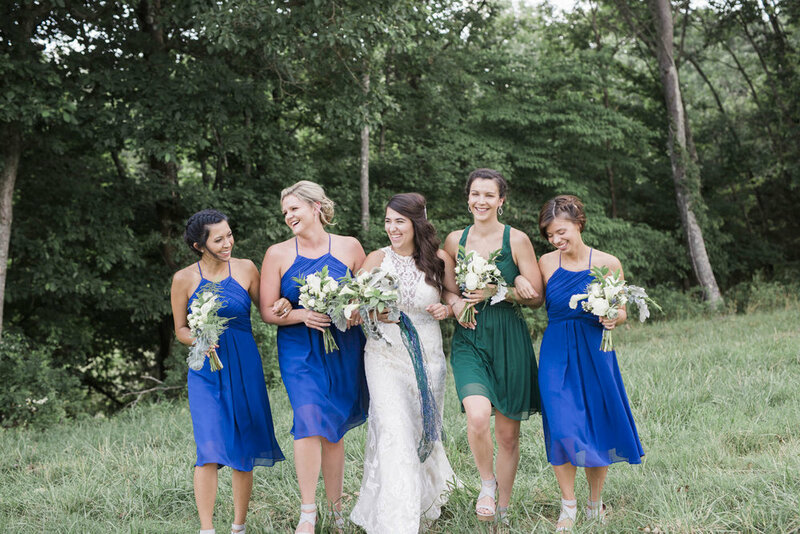 Of course, it was beautiful in itself, but the down-to-earth, sentimental touches that surrounded this day really pushed things over the top. I about died when we pulled up to the stunning farmhouse. 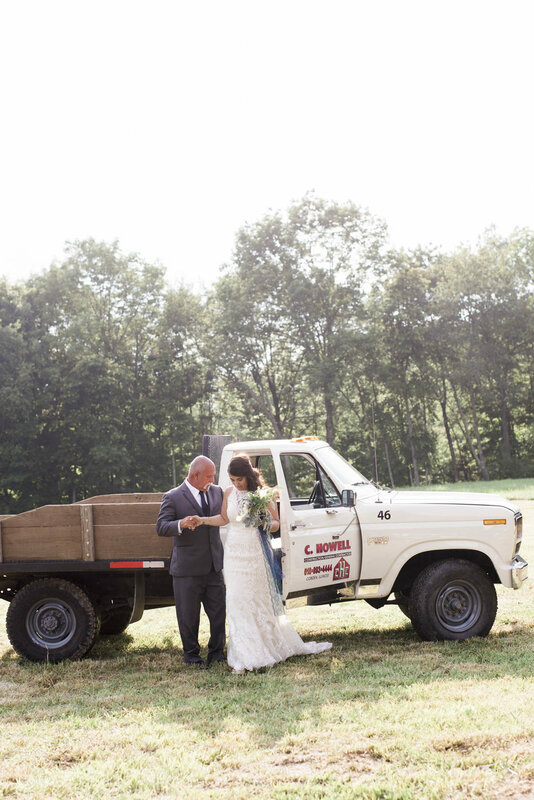 It was a PERFECT backdrop for the first look. 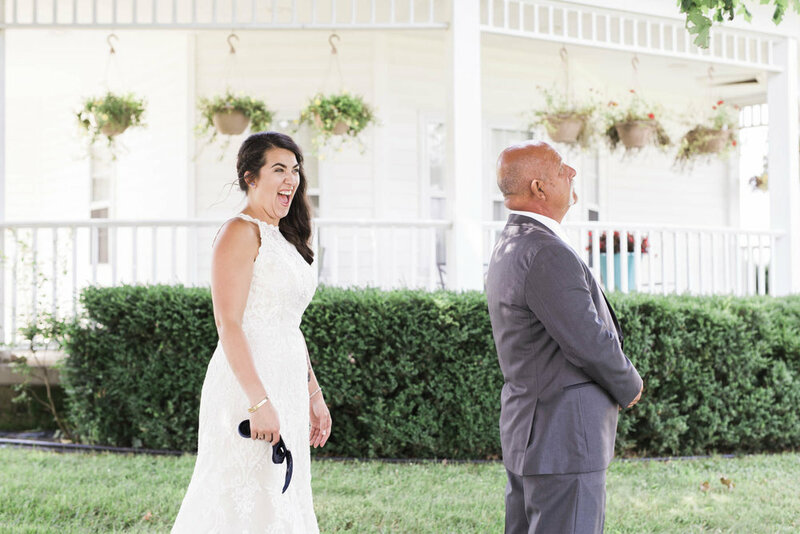 Then, there was the first look with Dad! 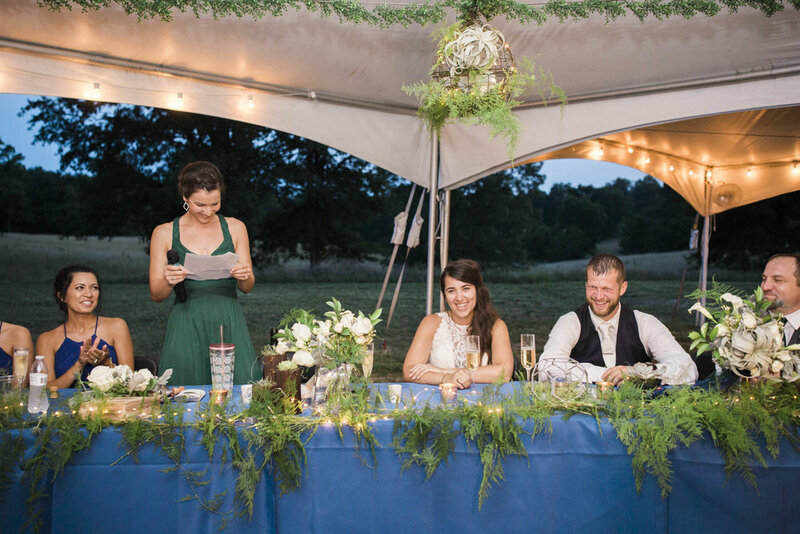 Guests were seated in the family’s buffalo pasture, one of Margaret’s favorite spots. 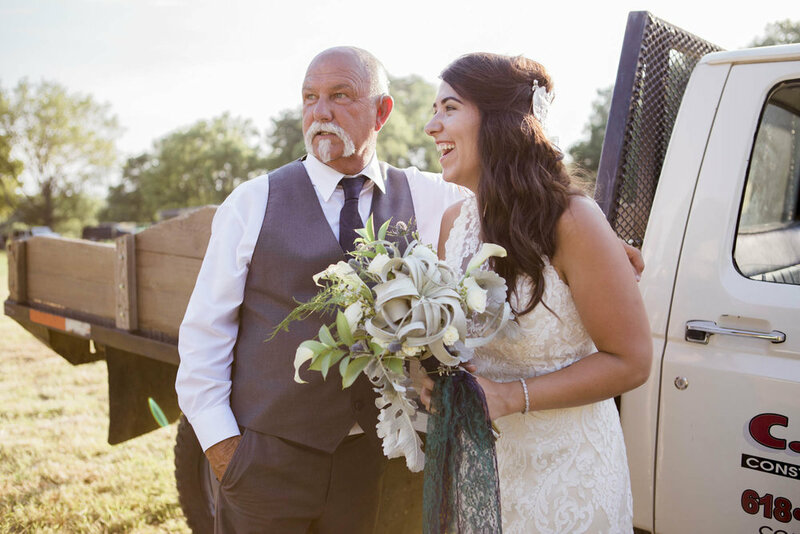 It was a HOT day, but we all forgot about the heat for a minute when the bride and her dad rolled up in his old truck, parked at the end of the aisle, and made their way to the front. It was perfect. 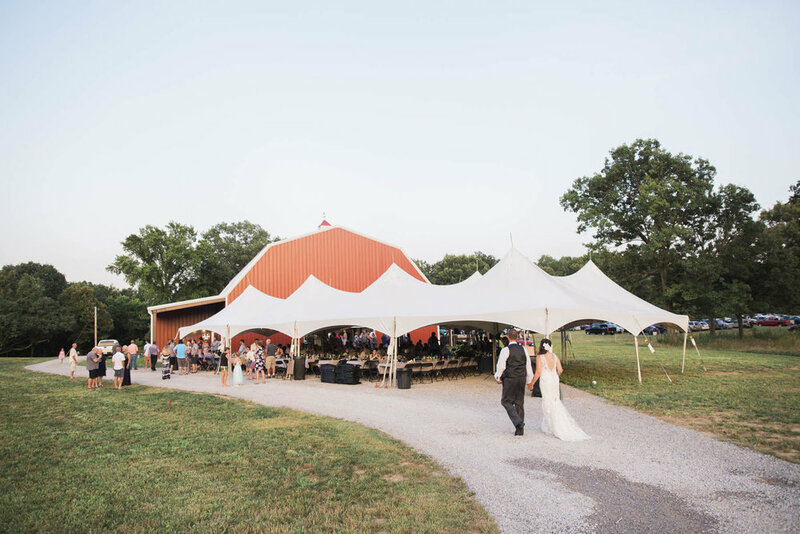 The reception tent was connected to the barn on the property, and they threw one heck of a party. 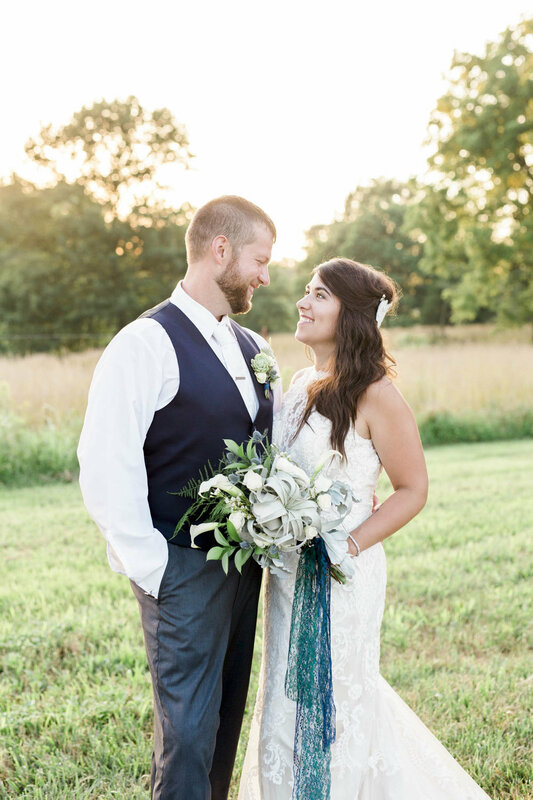 The couple even created their own wine label! Of course, it didn’t take much to talk these two into sunset portraits. Margaret and I were in each other’s heads the whole time when it came to chasing the best light. So, I stole them away for a few more minutes that resulted in this! 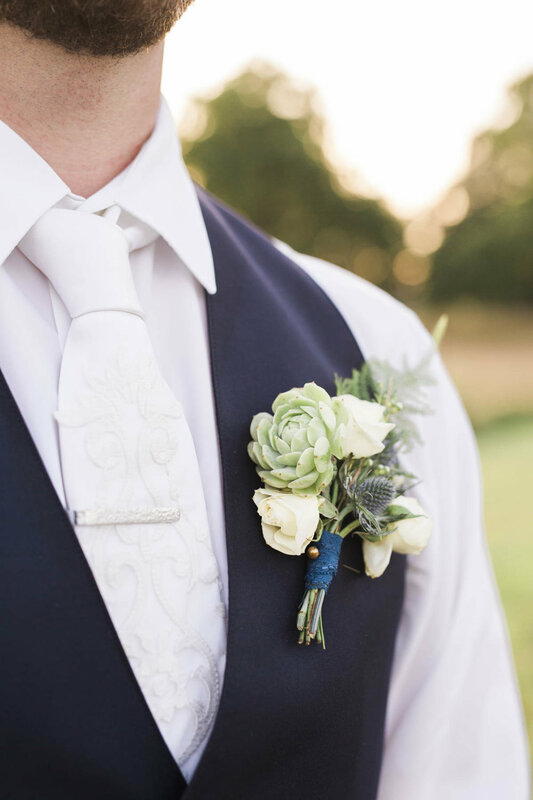 Deliciously Ordinary absolutely NAILED the florals and details. 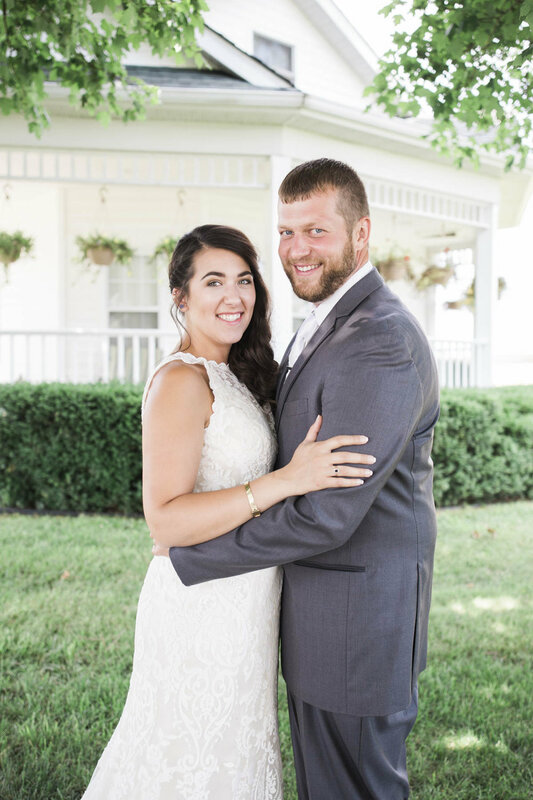 Shot by Chelsea serves Southern Illinois, Southeast Missouri and beyond with natural, authentic wedding photography. This is achieved through genuine friendship, constant support, and an all-inclusive experience. Visit our website to inquire about our services!